After reading Dorit Sasson’s excellent memoir Accidental Soldier I asked the author for insights into her writing process. She gave much of the credit to her editor, Brooke Warner. Her answer confirms a “secret” that has taken me many years to fully appreciate. Good, publishable writing relies on a collaboration between author and editor. To learn more about this creative relationship, I reached out to Brooke Warner, herself, to see what the memoir world looks like from her point of view. Jerry: One of the things I loved most about Dorit Sasson’s book Accidental Soldier was the exquisite sensitivity to her mental voice. She seemed totally tuned in to her own interior process and exquisitely capable of sharing it. That’s so important n memoirs, because one’s thought-stream gives readers the opportunity to learn how a character thinks. When I asked Dorit how she learned the subtle skill of writing her thoughts, she said you taught her. How did you learn to inspire and guide authors to pull these introspective realizations out of mind and onto the page? Brooke: In reading your book, Memoir Revolution, you identify something really important about memoir writing when you write that memoir writers are tapping into psychology and literature without necessarily realizing they are doing so. My parents are both psychologists, and while I never studied psychology in school, I’ve been exposed to therapy in various contexts my whole life. My mom runs a retreat center, and since I was fairly young I’ve been privy to the power of sharing story, and how self-expression heals and helps us better understand ourselves. This has given me a bedrock for how I hold people in their memoir process. It’s not therapy, but I do have a certain sensibility that leans that way, in addition to compassion for the writers I work with. Jerry: Wow. I’m so impressed by the way you’ve taken the sensitivity training from your home life and applied it to your working life. Interesting! That explains your insights into the workings of your clients’ minds, but how did you get so knowledgeable and sensitive to the form of memoirs? Brooke: I make no apologies for the fact that it’s my favorite genre. I’ve probably edited and/or published somewhere around 300 memoirs. My professional background is as an editor for a Seal Press, a women’s press in Berkeley, and I started She Writes Press in 2012, and we publish a lot of memoir as well. I teach a six-month memoir intensive with Linda Joy Myers, president of the National Association of Memoir Writers. We’ve co-authored two books together, Breaking Ground on Your Memoir and an anthology The Magic of Memoir. And I wrote an ebook called How to Sell Your Memoir. Finally, Linda Joy and I are co-leading our second annual conference this October in Oakland, also called “Magic of Memoir.” So I’m pretty entrenched in memoir all around. Jerry: That’s amazing. No wonder you’re good! You have invested a huge portion of your creative life into helping authors shape their life into stories. Cool. What got you into this line in the first place and what keeps you engaged in it with so much commitment? Brooke: The memoir thing started for me when I started working at Seal Press in 2004. I’d worked in publishing for five years before I started working at Seal, but it wasn’t until Seal Press that my editorial focus became so strongly memoir-focused. During those eight-plus years as an acquiring editor and ultimately Executive Editor, the vast majority of the projects I acquired and edited were memoirs. On a more immediate level, I was working with memoirists who were baring their souls. I witnessed firsthand what they went through to get these projects out, and then what they experienced when their memoirs came out in the world. There was often a lot of praise and good reviews, but I also saw and experienced the backlash against memoirists, and specifically women memoirists. Part of my passion for this genre comes from a kind of Momma Bear instinct. I didn’t actually become a mother until 2010, but for years before that I was a mom of sorts to my authors. In-house editors get very close to their authors, and I’m no exception. I was part-mother, part-therapist, part-friend, part-midwife, part-taskmaster. You wear a lot of hats, and I was well-suited to these roles. I was personally impacted, and oftentimes awed, by what my authors went through to bring their stories into the world. I have been a champion of this genre as a result of walking the path with my authors, and feeling that what memoir writers do is hugely courageous, and one of the most vulnerable acts I know of. I believe memoirists should be celebrated, each and every one of them, and instead they’re so often met by criticism from family and friends, and cultural criticism for the very act of writing personal story. 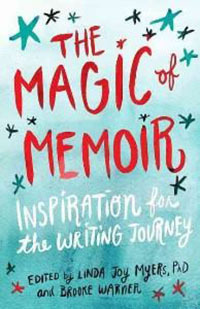 All memoirists need champions, and champions of memoir need to voice their support. Amy Ferris, a Seal author (her memoir is called Marrying George Clooney) and my dear friend, says that memoir saves lives. And I absolutely know this to be true. It saves the lives of the writers who write them as much as the people who need to read them. Jerry: Because of all the years that Linda Joy Myers has put into building a community of memoir writers, I consider National Association of Memoir Writers to be one of the most important hubs of the Memoir Revolution. What is it like for you, being in a position where so many people come to look for help finding the stories of their lives? Brooke: I agree, and I love my partnership with Linda Joy Myers. We have a really similar sensibility, and she’s an equally passionate advocate for memoir and memoirists. I feel so lucky to teach alongside her. When we met, I knew I’d found a kindred spirit! As far as what it’s like to be in my position, it’s wonderful, and sometimes hard. What’s hard about it is that so many people have the dream that their book can be a breakout bestseller. And a lot of people come to me for coaching, or join my classes, and what they want more than anything is validation—that their story is not only worthwhile, but well-written, going to get agented, going to get a big advance, going to sell tons of copies. Of course most of the memoirs I work on these days don’t go on to get big agents, big advances, or become bestsellers. The publishing climate is the most contracted it’s ever been. The only memoirists who are getting those kinds of agents and advances are people who are already famous, or who have big author platforms, or who have something that’s trending in such a way that the traditional industry sees a project as a risk worth taking. I’m encouraged because I think there are countless brilliant books whose authors are committed and willing to take them to the finish line, with or without a traditional deal. The new revolution that we’re in the middle of is the Indie Revolution, and a lot of memoirists are riding this wave. And so I love talking to writers of all stripes, but I also try to gently introduce a bit of publishing realism to those who have stars in their eyes about a publishing paradigm that no longer exists. To visit Brooke Warner’s home page, click here. This entry was posted in interview and tagged Brooke Warner, Dorit Sasson, editor, interview, memoir by jerrywaxler. Bookmark the permalink. I was fortunate to recently attend Brooke and Linda Joy’s Magic of Memoir Conference. It was terrific! Great to see this interview with Brooke here. That’s so cool you had the chance to actually meet fellow memoir people in real life – I am so grateful to live in an age when we can communicate so freely through the internet. But then actually meeting people, that’s something else. A room full of memoir writers and lovers. Nothing like it.